Sometimes it seems like I just can’t satiate my sweet tooth. When I am hooked on carbs I am a sugar junkie. Metformin makes me less inclined to eat sweet treats, but my brain still wants to end a perfect meal with something sweet. 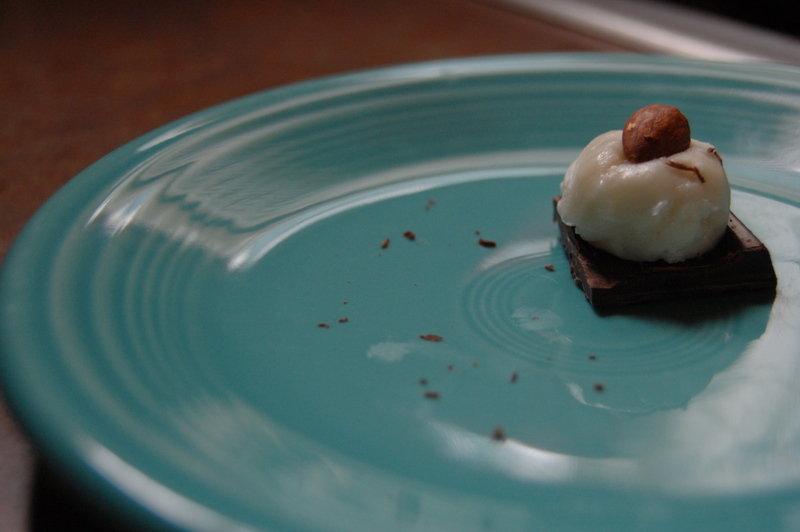 The other night as we were craving our sweets J. say to me….. Almond Joy! I gave him a look as he proceeded to explain……. Warm coconut butter in microwave for a couple of seconds until warm. Scoop out and onto chocolate, top with almond. Brilliant I say! You don’t want to eat a lot of coconut butter because it has a lot of fat, but coconut butter is kinda like peanut butter. As in, the flesh of the coconut has been pureed until it becomes thick and spreadable. It is nutritional, melts in your mouth and has no sugar. You can buy coconut butter at natural food stores, look over by the other nut spreads. It is a bit expensive so be prepared. Chocolate has been shown to have some good health attributes, and it seem to me that if you are pairing your chocolate with enough fat and the sugar content is kept low enough, that a few pieces now and then might actually be beneficial.